The Georgian alphabet is really hard to learn, mainly because so many letters look the same. By looking the same, I don’t just mean similar, like “b” and “d”. I mean that in certain fonts, it can be difficult to distinguish between letters even after spending a minute looking at them. This word contains “g”, “b”, and “m”. Can you tell which is which? If you include some obsolete letters which fell out of use in the nineteenth century, the Georgian alphabet contains five characters that look like the numeral “3”. Seriously, even Georgians have trouble telling these apart. 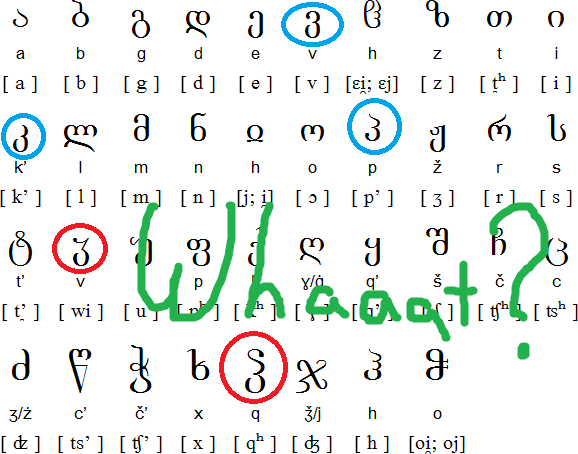 The Georgian alphabet has more letters than the Latin alphabet (the one we use), but it doesn’t have upper and lower cases. Georgians typically use QWERTY keyboards with a standard assignment of Georgian letters to Latin keys (when two letters are assigned to the same key, the second is selected by holding down shift). Note that one of the Georgian letters for “k” is assigned to the “Q” key. This is why some English-speakers stupidly refer to the Georgian language as “Qartuli” rather than the more sensible “Kartuli”. Handwritten Georgian is often easier to read than printed because handwritten letters go above and below each other, whereas printed letters are often at the same level. Although it’s often hard to read, I find the Georgian alphabet enjoyable to write. Writing Georgian letters is an easy way to dazzle Georgians. Besides Georgian, the Georgian alphabet is sometimes used to write Mingrelian and Svan (like Georgian, members of the Kartvelian language family), and in the past it was occasionally used for languages like Chechen. 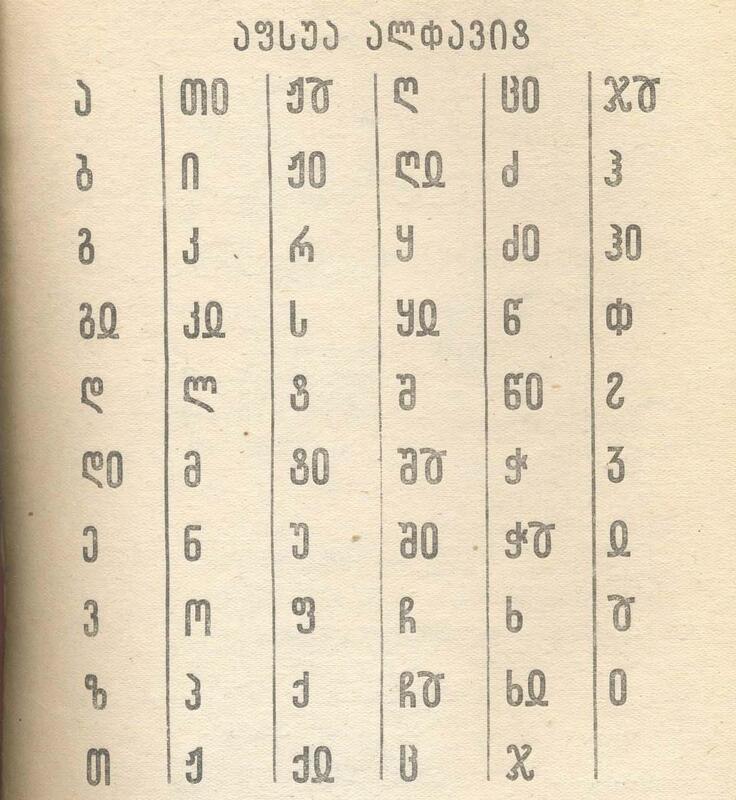 A variation of the Georgian alphabet was used for Abkhaz from 1938 to 1954 as part of the Soviet attempt to Georgianize Abkhazia (due to Georgian Soviets Lavrenti Beria and Joseph Stalin). Could the Georgian alphabet get any harder? Yeah, it could. 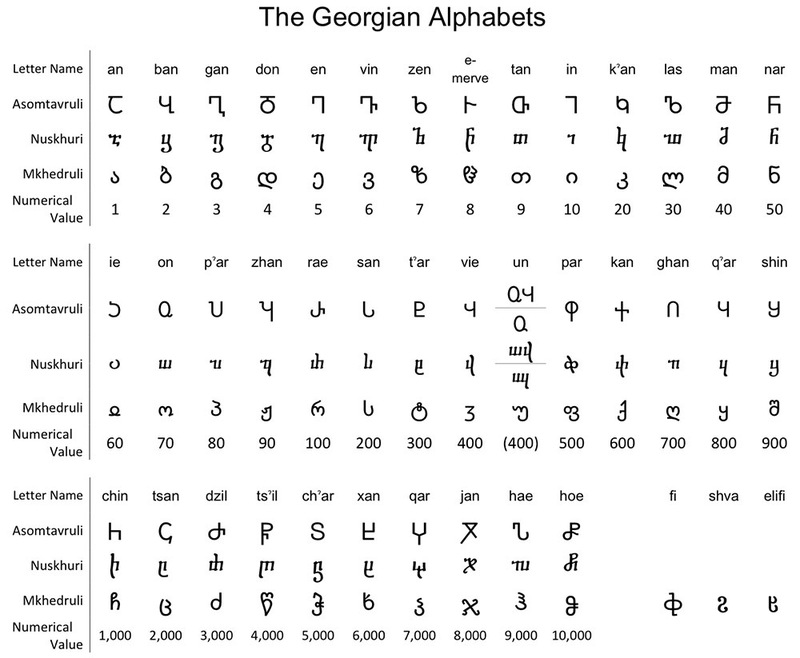 I’ve been saying “the Georgian alphabet,” but in fact there are three Georgian alphabets which have been in use at various times. The earliest is known as asomtavruli, and the later two (which probably developed from cursive forms of asomtavruli) are nuskhuri and mkhedruli. Mkhedruli is the one that has been used for daily life since the nineteenth century. The other two are mainly used for religious purposes. Note how in all three alphabets, the letters for “j” (as in jvari, “cross”) and “k” (as in “Christ”) are crosses. Neat, right? From what I gather, knowing the older alphabets well takes about the same level of education as knowing Roman numerals well, which is to say that it takes some education but not a lot. Many believe, partly on the basis of graphical similarity, that the Georgian and Armenian alphabets come from the same source. 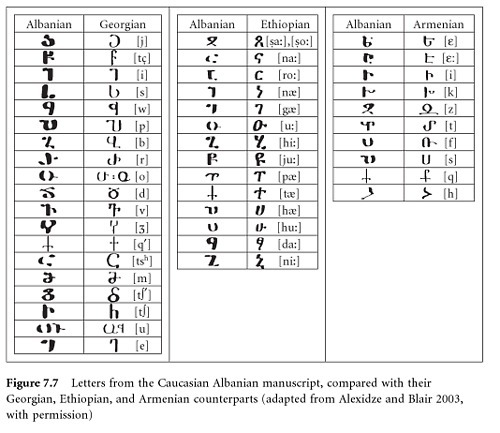 There is also graphical similarity between these alphabets and those of Caucasian Albanian and Ethiopian. Caucasian Albania has nothing whatsoever to do with Albania, just like how Caucasian Iberia has nothing to do with Iberia. A skeptic might think “Okay, maybe they use that alphabet for some things, but they use Cyrillic a lot too, right?” No. Today, Cyrillic is mainly found on things which are meant to be thrown away, like candy wrappers, and things which should be thrown away, like run-down old buildings. Things that are new and permanent are usually either in Georgian or Georgian / Latin. Beyonce loves Georgia. Why shouldn’t you? I’ll end this post by crediting a picture source, namely the creator of the onionized Georgian alphabet. This entry was posted in History, Language and tagged abkhaz, albanian, armenia, armenian alphabet, beria, cyrillic, ethiopian, georgia, georgian alphabet, georgian language, history, kartuli, latin alphabet, qartuli, stalin by georgiasomethingyouknowwhatever. Bookmark the permalink. 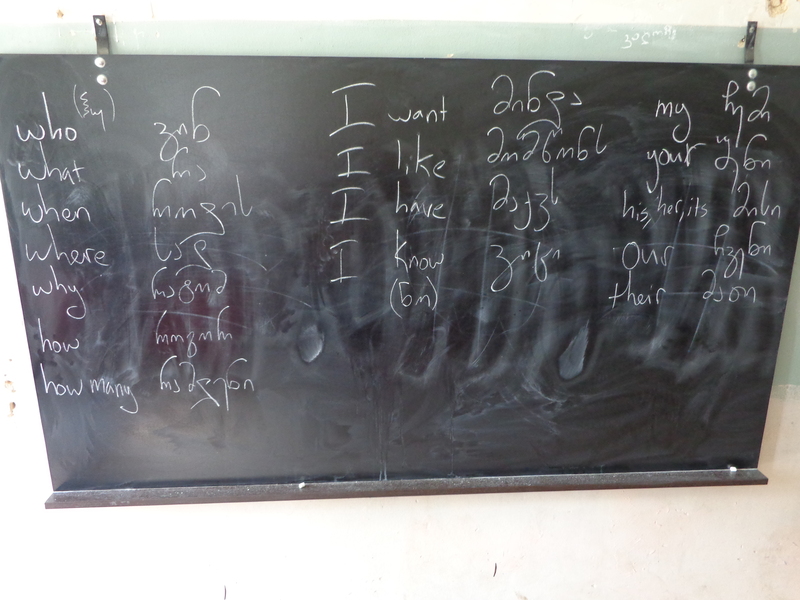 1) Is that your handwriting on the blackboard? Why is your Georgian handwriting so much better? 2) This is somehow the first time I have noticed you bolding words. What’s up with that? All the handwriting is mine. For the words that I know, I can do Georgian on a chalkboard about as fast as I can do English. I’d say my English looks pretty good on this one (my a’s could use some work, but keep in mind that the r in “your” isn’t mine). The bolding thing started a few weeks ago. It looked effective when I saw it on another blog, so I went through all my posts and bolded the important parts. Apart from drawing the reader’s attention, I think it helps to accentuate the rhythm of the writing without being too obtrusive. Gargat havar? More Georgian lessons, please! I am permanently stuck on lesson one, and the alphabet is, indeed, difficult to learn. Maybe a few short sentences in Georgian showing both in the latin (or phonetic) alphabet and the mkhedruli alphabet? “Where is the bathroom?”, “I am hungry,” and more would be helpful 🙂 Zalien didi madlobt. By “lesson one,” do you mean the alphabet? Strictly speaking, you don’t need to learn the Georgian alphabet to learn the Georgian language. In fact, strictly speaking, you don’t have to learn any writing system to learn any spoken language — otherwise illiteracy wouldn’t exist. My advice for learning the Georigian alphabet is to practice writing languages that you know (English, or whatever else) in the Georgian alphabet as best you can. ჰირ იზ ან ექსამპელ ავ ინგლიშ რიტენ ინ ზე ჯორჯენ ალფაბეტ [Here is an example of English written in the Georgian alphabet]. Approximations and guesses will be necessary, but it gets easier. By the way, the Georgian word for “very” is dzalian [ძალიან], not zalien. But that mistake doesn’t matter a lot when it’s spoken. Thank you for your help. Though willing to make mistakes rather than not try a new language, I prefer to get it right when I can. 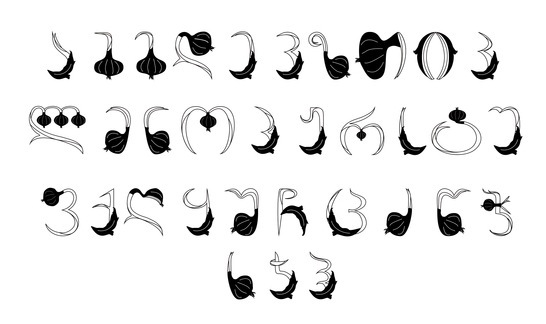 The Georgian alphabet is so beautiful that I hope to learn it. For now, I do mainly speak the little Georgian I have learned with a couple of people. One has been away for a while. We are friendly acquaintances, but not personal friends, and he is older than I. He often jokes that he is “beberiwar,” which is not really the case (and no doubt misspelled.) How can I politely say something like “I’ve missed you”? I think I should say this without adding the nosy “Where have you been?” which is none of my business. “Where have you been?” is a useful phrase, but more to be used with children, or in jest, when you are sure the reason for absence is not serious or personal in nature. The older (not elderly!) Georgian gentleman is a true intellectual, and though he jokes with me, prying is a different matter. I’m not sure exactly, but it sounds like you’re trying to say “Kargat (a)khar?”, which means “Are you well?” The “a” is in parentheses because it’s often said, but as far as I know it’s an “improper” dialectical variation, so I don’t know how it should be written. The other phrase is “Beberi var”, meaning “I’m old.” (Georgians don’t distinguish between English v and w sounds, so words written with “v” are often pronounced as w.) However, I’m really not the best person to give Georgian lessons, especially online, since I’m only barely literate in Georgian myself. Whenever I write down the Georgian words I know, it’s often an anglicized or gallicized representation of sounds I only partially understand, not unlike how you’ve done it. This is an inevitable and amusing consequence of learning a language in real-life situations (as opposed to from a textbook). As far as culture and language being intertwined, I addressed that topic (in harsh terms) here. Garmajoba Giga. My name is Anna & I am Georgian, but I don’t speak it because i was never taught, I was only taught Russian/English. I was hoping you could tutor me online if you have the chance. I know its random for you but I was hoping if you could you could teach me. Thank you. Very interesting. I have found learning the written alphabet very helpful in reading the signs on the buses, memorizing the districts in Tbilisi and in general just getting around….and you are right the people really are impressed……I practiced by showing my family and friends how their names looked written with the Georgian Alphabet . Their alphabet it is so beautiful ! What an incredible moron you are!!! How can you Georginize Abkhazia it it IS was and will be one of the regions of Georgia!!!! DO research!!!! JJ is right if you are interested in the Georgian culture do some proper research. It seems that you are trying to make it look like a foolish and nonsence culture. Georginize Abkhazia? Damn man that’s a harsh thing to say about a region of Georgia. Hmmm it was so rude!!!! If you want to make some corrections make it in a polite way!!! How couldn’t you appreciate that this person is so much interested in Georgian culture?! You look way more moron after ur words!!! Actually, Abkhazia was taken by Russia, so it is TECHNICALLY not a part of Georgia anymore…. it’s confusing. I don’t think Georgian is hard to write at all. I also don’t think you’re examples are that similar. Georgian “o” and “r” are obviously different in that the “r” has the line coming down, just like English “b” and “o” are obviously different despite just being a line different from each other. You group “l” and “d” and “gh” yet to me there’s a big and obvious difference between a single closed circle in the “d” and three open downstrokes in the “l” and two open downstrokes in the “gh.” Just like in English, it’s obvious that the “m,” “n,” and “h” are different despite being no more different than the Georgian examples you gave. Also with “b” and “g,” one has a sharp top and one has a curved top, similar to how “u” and “v” in English are only different because of a sharp point verses a curved one. It is a lovely script (my favorite, I think), though, and admire you trying to learn some of the language. ხო, ვიღაცეებს გონია რომ ორივე უნდა ისწავლო…. LOL?! I just want to point out, that English-speakers often refer to the Georgian language as “Qartuli” because of the hard K (ქ) versus flat K (კ). Using Q in Qartuli emphasizes hard K and produces more proper phonetic versus a transliteration to Kartuli. Also I think it’s important to stay away from such generalizations like saying that, in this context English speakers use Q instead of K “stupidly”. These generalizations are unpleasant. People use Q for ქ because of the standard Georgian keyboard letter assignment. That’s the only reason. Maybe another reason is that it makes foreigners in Georgia feel more “in”. None of them care about the difference ქ and კ. Notice that there’s no indication that თ is used, rather than ტ. I totally understand that Georgians use Q for ქ, and also Y for ყ, but there is no good reason to do these things in normal English writing. That aside, I’m interested in your terminology: “hard” to describe ქ (and I assume also ფ and თ), “flat” to describe კ (and I assume also პ and ტ). Personally, I like to think of the latter group as “hard” and the former group as “soft”. Did you come up with this terminology on your own? I don’t think any of us Georgians care whether “Q” or “K” is used. Really, it makes no difference. Actually, I believe “Q” would be more correct, because it is ქ. Also it sounds better than “კართული”. Qartuli or Kartuli is fine, bro. The issue is not what is correct or acceptable in Georgian; it’s about what’s correct or acceptable in English. In normal English, “qa” doesn’t mean anything and is never used. If you look in something like a “Scrabble dictionary” (like http://www.wordfind.com/starts-with/qa/), you’ll find several words that begin with “qa”, like “qat” and “qabala”. These words come exclusively from Arabic and Hebrew, both of which are Semitic languages. In Arabic, the “q” transliterates the letter ق, which represents a throaty sound that is completely foreign to English. That sound is, however, fairly similar to the Georgian ყ (see http://linguistics.stackexchange.com/questions/938/how-exactly-do-the-sounds-of-arabic-%EF%BB%95-and-georgian-%E1%83%A7-differ/13118#13118). Now, when average English-speakers come across a word like “qat”, they are confused as to how it should be pronounced. In a sense, this is how it should be: the “q” represents a sound that most English speakers could never pronounced or even comprehend. When they come across a word like “qartuli”, they will be similarly confused. However, the “q” in this case represents a sound practically identical to the English “k”. There is no reason to make it seem like a foreign sound when it really isn’t. But as I said earlier, foreigners who use “qartuli” instead of “kartuli” probably do so for precisely that reason: it makes it seem more exotic, and hence gives them some cachet to their friends back home. Since the ABC is in fact Latin, many languages use rules of Latin. K was not used in Latin. It was reserved for foreign variations of the sound. Similarly, in Georgian K should be used for ყ, Q for ქ, and C for კ in front of A, O, U, R, L, as in Latin. The dual pronunciation of C in English and other languages is a historical accident, and there is nothing besides tradition to recommend it. Using C in foreign transliterations is a really bad idea. As long as mistakenly or not “English and other languages” use Latin alphabet, they mistakenly or not use also Latin rules. I’ve already wrote about rule of using C and K in Latin and many languages follow it, mistakenly or not. Sorry, I had to repeat it one more time. With ABC as Latin alphabet, Latin grammar rules also were adopted. One on them is the Latin language has only one variation of sound K, while other languages have several. Latin rule reserved letter K for the variation of sound K in foreign languages. I like your post, even if some of your words doesn’t match the facts. So let me tell you that Abkhazia has always been part of Georgia. Abaza tribes settled in this territory in XVI. Their close interaction with local Georgian population has led to a fact that significant part started to use Abaza (Apsua) language. But the race has remained unchanged and they have always been part of Georgia, Abkhazia never needed to be Georgianized and they used Georgian alphabet just as other any other region ( Mkhare მხარე) did. Part of the Soviet attempt? NO. That’s definitely big mistake. The only Soviet attempt was to un-Georgianize, or “un-anycountry-nize” and unify all of them in one “Sovetski Soiuz” (but that already another story). Hmmm… I thought that Abkhazia was taken by Russians, but it is still kinda a part of Georgia… I guess living in America makes you oblivious to some things. I’m french and i have seriously big pronunciation troubles about some georgian letters. Guess wich one… ([k’], [p’], [t’], [q’], [ts’], [ch’], the 10th, 15th, 19th, 24th, 29th and 30th letters of the georgian alphabet respectively). If you put your hand in front of an English-speaker’s mouth when they say the word ‘pie’, you will feel a puff of air. That’s called ‘aspiration’. In English, the letters ‘p’, ‘t’, and ‘k’ (and maybe some others) are generally aspirated when they come at the beginning of syllables. But if you put your hand in front of their mouth they say the word ‘spy’, you won’t feel that puff of air. Those aspirated letters don’t get aspirated when they follow an ‘s’. The Georgian ejective sounds are similar to unaspirated English consonants. I´m gonna try to myself this method (i don´t want any trouble with my english friends 🙂 ). By the way, i read in another article of your blog you didn’t see a lot of georgian «elements» when you visited other countries (compare to armenian). In France you will find some district in and near to paris with orthodox church. (1) This post says: “Georgians typically use QWERTY keyboards”. But in this Wikipedia page, the traditional (non-QERTY) is called the standard. Which is true? Do Georgians usually use the QWERTY or the traditional? (2) Can anyone tell me the proper way to write ჴ (qhar)? From the top like კ (k.an), or from the bottom like პ (p.ar) and ჰ? Also, how do you hand-write ჵ and ჶ? ჶ is written like “p” in some Georgian fonts, and maybe that’s how you actually write it? I know they are obsolete letters, but I want to know anyway. Like 5 years ago I started learning Syriac as a hobby (by teaching myself). Syriac is a Christian language from like the 4th century, having nothing to do with today’s Syrian Arab Republic. Culturally it has something to do with Georgian, e.g. the page numbers of the Sinai Palimpsest (one of the two Old Syriac bibles) were written both in Syriac and in Georgian. Anyway, I’m interested in Georgian culture too, and would like to learn more. From the Syriac point of view, you are lucky to have a country. Some random info: In Japan, Georgia had been called by its Russian name (Gurzia) for a long time. The Georgian government asked us to change that, and it’s now called by its English name (Georgia), officially since 2015. But why don’t they ask us to use their own native name (Sak(h)art(h)velo) if they don’t like the Russian name…? This doesn’t make sense. Besides the English name Georgia is very confusing because it’s also a state of the US. Anyway, this is a fun post! “Whaaat?” Yeah, it’s a bit confusing that for example პა and კა are different. However, I actually think Georgian letters are nice and tidy, LESS confusing than some other writing systems, not to mention they look cute! Think about English for example, where the same letter “a” represents totally different sounds in “fat” “fate” “father” — at least პა and კა look different if you look hard enough! The keyboard layout you link to appears to have been used on old Georgian typewriters. I’ve never seen one in person, only in pictures (image-search for “georgian typewriter” to see some examples). A strange feature of Georgian typewriters is that they didn’t have a key for the numeral 3 — they used ვ instead! That said, every computer I ever used in Georgia had a QWERTY keyboard, mapping Georgian letters to Roman letters in a more-or-less straightforward way. This mapping is the default setting in Windows and Ubuntu, and probably others OSs too. Thanks for the clarification! Last month when I started learning Georgian, I was not sure which keyboard layout I wanted to use. I did some search and found this page. That’s how I stumbled upon your blog. Currently I’m using the QWERTY, but I’m still not sure. Even if the QWERTY is usually used in Georgia, maybe I want to use the traditional layout after all (personal preference). On Windows XP, the only Georgian keyboard layout was the traditional one (Q=ღ), so the QWERTY Georgian might be a relatively new invention. BTW the Armenian keyboard layouts (they are QWERTY too) do not have the numbers 2/3 either — I guess one was supposed to use Ձ/Յ instead. In other words, l33t speak! 1. You don’t need [Shift] to input a letter. You can type every letter by a one-key stroke. For example, თ is just [F], not [Shift]+[T]. 2. About one half of the key positions are exactly compatible with that of the standard Russian keyboard layout; the other half is also roughly compatible. Perhaps this makes things simpler if you can type Russian, or you’re more or less planing to learn both Georgian and Russian. So far, I’m comfortable with the traditional Georgian layout. I also use non-QWERTY layouts to type Syriac and Hebrew, though QWERTY layouts are also available for them. I guess this is my personal preference. BTW, to answer my own question (2), I found that some books by Marie-Félicité Brosset showed how to hand-write ჴ etc. That sounds like great testable hypothesis! What year was that keyboard layout adopted? Are there examples of “Qartuli” being used before then? Of course, even if its provenance is not the keyboard layout, there remains the question of what the point of using “q” is. I did quick search: Windows Vista was released around 2007, while qartuli.com was registered in 2000. I guess young Georgians have been influenced by the keyboard layout. But you’re talking about “stupid English-speakers”… Do “stupid” foreigners even know how to type Georgian? If anyone is responsible for this strange-looking spelling, perhaps Georgians themselves are. Or, maybe Microsoft devs who designed this keyboard layout are most responsible. The foreigners I had in mind were mainly my fellow English teachers. Search around in TLG blogs and you’ll find plenty of instances of people saying “Georgians don’t call their language ‘Georgian’, they call it ‘Qartuli’!” My point is that there is no good reason in the rules of English spelling to write it that way. I’m sure some of those people came to know the ‘Q’ spelling second- or third-hand and never typed any Georgian at all, but my hypothesis remains that it derives ultimately from the keyboard layout. It would be fascinating to get an authoritative account of how that developed. Search for “qartuli”, and you’ll notice that many instances are actually “qarTuli” with an uppercase “T” in the middle. Also, search for “maswavlebeli”! English-speakers, stupid or not, would never type this way, right? What are these spellings then? This should be unofficial ASCII-Georgian used by Georgian-speakers, encoded in such a way that the original spellings will be clear for both humans and machines so that Georgian letters will be shown properly just by selecting a quasi-ASCII font, where “a” is actually ა, “b” is actually ბ, and so on. Especially, “t/T” are ტ/თ respectively. If so, why not “k/K” for კ/ქ – or more to the point, why “q” for ქ? That I don’t really know, but perhaps this was originally Chat Georgian, where people wanted to be lazy, not wanting to press the [Shift] key. So they used “q” for ქ and “y” for ყ. Similarly, “p/f” instead of “p/P”. The scheme is almost always consistent, in that the normal t/k/p/etc. are used for unaspirated consonants, while their aspirated counterparts are expressed as some kind of variation (e.g. T as opposed to t). Was this hack invented around 2007, first in Windows Vista, as the Georgian QWERTY keyboard layout? Maybe not. It’s probably much older than that, as this hack has a lot of hallmarks of the pre-Unicode era (Windows 95/98 or before). My guess is, the new keyboard layout is based on this ASCII-encoding, and not vice versa; in other words, “qarTuli” predates the keyboard layout, but the keyboard layout and this spelling are indeed related. So I think your hypothesis is essentially correct, with slight modification. Your Georgian friends (especially long-time computer users) should be able to explain the history of this more clearly. Maybe a few fonts were quasi-Russian back then, instead of quasi-ASCII. Then, are English-speakers not responsible at all, as they’re simply using the spelling second-hand? Well, I can see your point: if an English teacher doesn’t know the fact that in English “q” is never used except in front of “u”, that’s a problem. Then again, there are always exceptions like “Qatar(i)” or “Al Qaeda” or “Qantas”. They may feel “Qartuli” is plausible based on “Qatar(i)”. If a teacher is confused by such a false analogy, technically they are to be blamed! But this doesn’t seem a big problem. Especially, if it’s just a transliteration within quotation marks, any romanization scheme is valid, and certainly not stupid, as long as used consistently. The Georgian QWERTY keyboard layout that came with Windows Vista already existed in 1994. The 42 fonts (1994-2000) by Slava Meskhi are like that. My comments related to Windows Vista were wrong! Even before Windows 95, q = ქ was sometimes, if not commonly, used in Georgia, when your fellow English teachers were still tender children (they are certainly not responsible for the strange-looking spelling). Your hypothesis about keyboard-based spellings is testable in a more generic sense. If you type ქართული as ASCII using a Russian-like keyboard layout, you’ll get “mfhsekb”, and search engines can indeed find “mfhsekb” used this way (“mfhsekb” is shown as ქართული if a suitable font is selected where this encoding is used). As it turned out, there also existed 8-bit encoding systems for Georgian, where აბგ… were encoded as ÀÁÂ… (hex C0 C1 C2…). 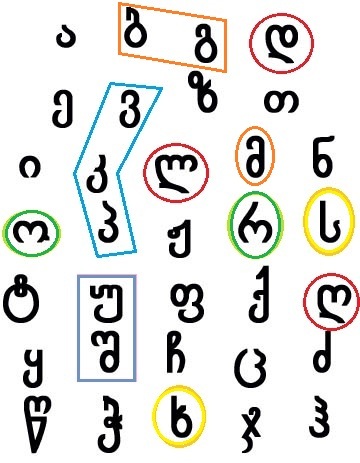 But just to reiterate: my object has never been to Georgians using q for ქ when writing Georgian (after all, they’re the only ones reading it), but rather to that character mapping being used in English. My hypothesis about the etiology of that usage is secondary to that main objection. I think you’re a little fussy about letters looking alike. That’s just lack of habit. I mean d and b are virtually identical in print, I mean how is anyone going to learn the latin alfabet with this: bdpq? Yet we do. Or how about I and l (that’s an i cap and an L in small), or what about j and i? Yet we make no mistake about them just like we don’t confuse f with t .
b and d are easy to distinguish: one has the circle to the left of the line and one has the circle to the right of the line. If you put the two letters next to each other, anyone who can tell left from right can tell them apart. Now look at the მგლები poster. Do you think those characters are easy to tell apart? It took me a long time to figure out what that word was. I’m talking about difficulty with merely parsing the letters. Well, you’ll say, that’s just because it’s a stylized font, and the Roman alphabet can also be written in stylized fonts that are hard to read. Yes, but certain Georgian letters don’t take much bending to be made to look alike. And l and I is a problem typographically, and it does cause confusion. გამარჯობა! სირიულ ენას და ქართულ ენას ვსწავლობ. I can see why b and d COULD be confusing. As a beginner of Georgian, I’m still bad at ნ and მ myself. Yes, “just lack of habit”! In Syriac, ܒܐ and ܟܐ and ܝܐ and ܢܐ and ܥܐ and ܠܐ are all different. With some getting used to, you wouldn’t be much confused by them. I know that, and so I’m mentally ready for ვ and კ and პ and ჳ and ჴ.
Japanese takes the cake, though, where 杮 and 柿 are different, ン and ソ are different, ツ and シ are different; 土 and 士; 己 and 已; 千 and 干; the list goes on and on. 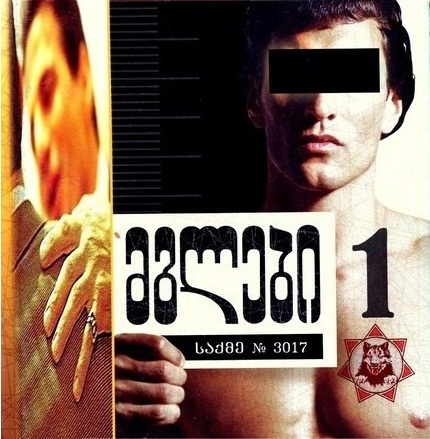 Anyway, I think it’s important to note that “title case”-like Georgian fonts (as in the poster) are exceptional. As of writing this, my computer has 15 fonts that support Georgian, and only one of them (BPG Nino Mtavruli) is like that. In the other 14 fonts, ბ has an ascender, გ has a descender, and so on. But look, ნ and მ are very easily distinguishable: ნ points one way, მ points the other way. Sure, maybe you can’t remember which sounds they represent, but anyone can tell them apart. ツ and シ, on the other hand, are not easy to tell apart at all (at least in the font I’m looking at right now). In fact, without someone telling me so, I would never even have noticed they were slightly different. Those two letters are hard to parse, and letters that are hard to parse are confusing. That’s the point I’ve been making over and over. Thanks for the pictures! The “titlecase” style in question seems to be called Mtavruli მთავრული (not to be confused with Aso-mtavruli, the oldest one of the three Georgian alphabets, though both are similar in a way, in that every letter has the same height, with no ascender or descender). Search n4712 georgian, and you’ll find a PDF file with a lot of fun pictures about this (something that looks like an article from your blog)! Apparently, this style is used when bold letters would be used in English, as in book titles, headlines, emphasized text, shop signs, road signs, and so on. Although bold letters are not rare (they’re usual in signs, like you said), I think it’s fair to say that they are relatively exceptional, as normal letters are obviously not bold. You say ბგ in this style (Mtavruli) are confusing. I understand what you’re talking about 🙂 Still, I think it’s just that you don’t know where to look 😀 One has an angular hook like “7”, the other has a curvy hook like “?”. Things like this happen all the time in Japanese; it’s not a big deal once you learn what the difference is. I have learned a dozen of alphabets (e.g. Japanese has 3, Syriac has 3), and based on that experience, I’d say the Georgian alphabet is cool — less confusing than average. That said, I’m not yet “automatic” about this alphabet. I can decipher მ and ნ correctly only if I stop and think. I’d like to recognize them more effortlessly without even thinking, and for that I need more time and some getting-used-to. I forgot to mention something in my previous comment. A few fonts have Mtavruli glyphs (stylish ones), using the Unicode code points for Aso-mtavruli characters (ancient ones). For example, the Unicode characters ႡႢ are officially ბგ in Aso-mtavruli, but in some fonts, they are ბგ in Mtavruli. 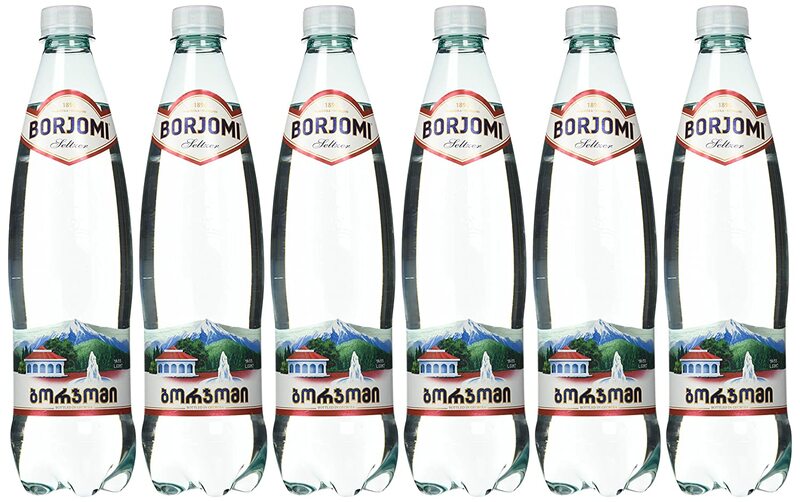 3 out of the 15 fonts on my computer that support Georgian do this trick (BPG Glaho, FreeSans, FreeSerif). 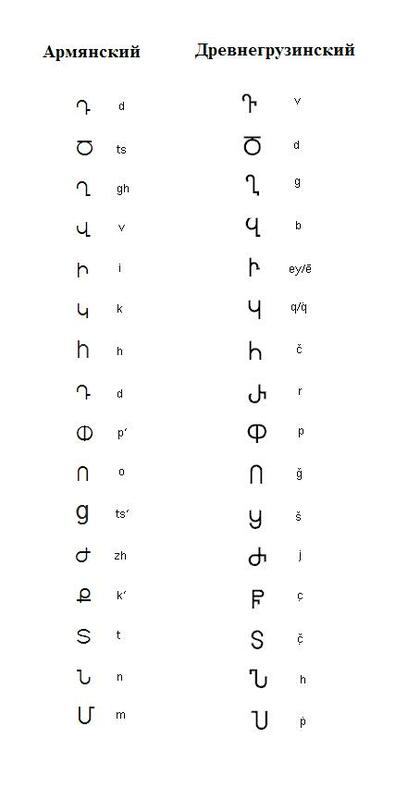 The letters in the Georgian alphabet are not the same. It’s hard for a stranger just because it’s similar in English (m-n) (j-i-l) (b-d) (v-u) (E-F) (q-p) (s-z). There is a need to observe the difference in all the script. The Georgian alphabet has nothing to do with floating Cyrillic. Today Georgian is a perfect alphabet. Consists of 33 letters. One letter is always one sound (read alike), we do not have mute letters and coordinates. Some of the sounds are not in European languages, so Europeans can not say (their analogue is not in Latin, they can not speak English in English). But we can write all the English words, we have all the sounds. You wrote: “Caucasian Iberia has nothing to do with Iberia.” HOW DO YOU KNOW? Aside from the names, there is no reason at all to believe the regions are connected. Similarity of names is not a reliable means of drawing strong inferences. So that doesn’t leave the idea with much of a basis. 4) Telia, Melia — Georgian and Spanish family nsmes. 6) Ur — water on basque and old Georgian. 7) Bur — cover in Basque, Burva, – covering in Georgian. 8) Pipril– ash in Basque, Perpli — same in Georgian. 10) Gori — towns in Spain and Georgia. Fascinating, I had no idea. And it looks a lot like Tolkien’s Elvish alphabets. Maybe he was inspired by the Georgians? I don’t know of any specific connection, but Tolkien was a philologist and a linguist, so he must have had at least a passing familiarity with the scripts of the Caucasus. “the Soviet attempt to Georgianize Abkhazia”? the pic says “aphsua alfavit”. aphsua people were not abkhazian people natively. it was stalin’s attempt to divide Georgia and Abkhazia (which he successfully did) with pretending abkhazian people were aphsua people. Be careful when saying something as loud as it is.